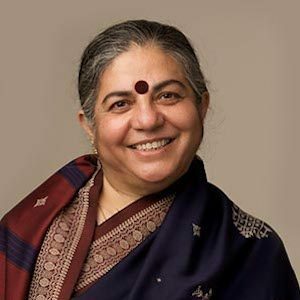 Vandana Shiva trained as a Physicist at the University of Punjab and received her Ph.D. from the University of Western Ontario, Canada. She later shifted to inter-disciplinary research in science, technology and environmental policy, which she carried out at the Indian Institute of Science and the Indian Institute of Management in Bangalore, India. In 1982 she founded the Research Foundation for Science, Technology and Ecology in Dehra Dun and founded Navdanya in 1991. Working with local communities and organizations, Navdanya has conserved more than 3,000 rice varieties from across India and has established 60 seed banks in 16 states across the country. In 2004, Shiva started Bija Vidyapeeth, an international college for sustainable living in Doon Valley in collaboration with Schumacher College, U.K. Her work spans from teaching at universities worldwide to working with peasants in rural India. Time Magazine identified Shiva as an environmental ‘hero’ in 2003 and Asia Week has called her one of the five most powerful communicators in Asia. Forbes Magazine named her as one of the Seven Most Powerful Women on the Globe in 2010. She chairs the Commission on the Future of Food set up by the Region of Tuscany in Italy, is a Board member of the International Forum on Globalisation (IFG), and is a member of the Steering Committee of the Indian People’s Campaign Against the WTO. Shiva has contributed in fundamental ways to changing the practice and paradigms of agriculture and food. Her books The Violence of the Green Revolution (1992) and Monocultures of the Mind (1993) pose essential challenges to the dominant paradigm of non-sustainable, industrial agriculture. Through her books Biopiracy (1997), Stolen Harvest (2000), and Water Wars (2002) she has made visible the social, economic and ecological costs of corporate-led globalization. Her contributions to gender issues are also nationally and internationally recognized. Her book Staying Alive (2010) dramatically shifts popular perceptions of Third World women. Vandana Shiva serves on Prince Charles’s expert group on Sustainable Agriculture and she is a member of President Zapatero’s Scientific Committee in Spain. Shiva advises governments worldwide, and is currently working with the Government of Bhutan to make Bhutan 100% organic. She is also working with the Governments of Tuscany and Rome to create a hopeful and livable future for young people in these times of crises.